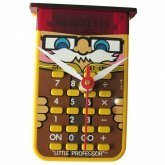 Meet The Little Professor Calculator clock. 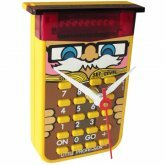 Released by Texas Instruments in 1976, it had buttons, flashing LEDs, and kids were utterly fascinated with it! Let the happy memories come flooding back with this free-standing desk clock, made from a gutted Little Professor calculator. Sure to bring a happy smile to the face of any computer geek or 80's child.